What can I say, besides this is one seriously cool piece of tech. My first purchased wearable is definitely not a dud, and all the negative reviews I’ve read, are just flat out wrong. For the first time in a smartwatch, the face is round, instead of square or rectangular. While this does make some notifications or texts awkward, as they get clipped in the corners, I have yet to see a case where it is really an “annoyance”. One of the big negatives I had read before the watch came out was about it missing a little piece on the bottom of the circle, not giving it the full round look. Now sure, when I look at my watch (depending what face I am wearing) I may notice that the ‘6’ is not there, but I honestly haven’t even realized that it is “missing” unless I am specifically looking at it. Most days, after charging it overnight, I had to put it back on its wireless charging cradle by 4 p.m. If I had to guess, the author probably had the “ambient sensor” turned on, among who knows what else. Me personally, I take it off the cradle at 5AM after an overnight charge, and after using it a full day, until 9:30PM, it has had 40% battery life left (on the worst day). This is with the watch getting notifications throughout the day, and with me getting “new tech fever” and playing with it all day as well. This was my biggest concern when I ordered the watch. While my wrist is not thin, it is not huge either, and I was worried that this watch face would look enormous on me, and that the weight would be undesirable (one of the reasons I stopped wearing my old watch). Happily, I don’t even notice when I am wearing it. The face is the perfect size for my wrist (and yes, everyone is different), and the weight is light enough for it to feel like a normal watch. 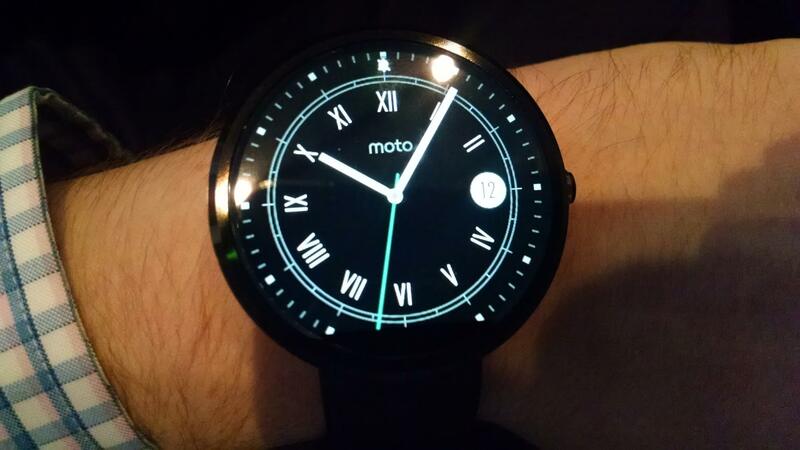 The Moto 360 is priced at $250. For a standard watch, that price point is a little high. For a piece of technology, it is right in the middle. Compared to Apple…well in that case it will leave you with plenty of money to buy hot drinks while you watch the Apple-fanatics sit outside on line for their Apple Watch mid-January. If I wanted to see every notification on my phone, I’d just hold my phone in my hand all day. Well, thankfully with the Android Wear app it now gives me the options to mute certain apps, while allowing others to come through. So while I am happy to see my emails/texts/Sports Center notifications throughout the day, it is completely unnecessary for my Dice With Buddies notifications every few minutes. The biggest question of course is: What do you need that, if your phone gives you the same information? I’ll answer that on the bottom in my Overall (don’t want to get ahead of myself). One of the big issues while driving and trying to get directions is that you need to constantly glance at the phone to see where your next turn is…and if someone else in the car is using your phone, you keep having to ask them to check the next step for you. With the watch, it is oh so simple. For starters, you can just tell the watch where you want to go (like I’ll say “Go Home” and it’ll connect with my phone and find the best route). Then as you approach your turns, the watch gives a tiny vibrate on your wrist to notify you of an upcoming move, and when you glance at it, it’ll say straightforward “Turn left in 200 feet at Adams Street”. 90% of the time I pull out my phone, it is to check the time or to see what that vibrate was for. Of those times that it is an email, at least 80% of them get deleted without being opened. Now I can just look at my watch, get my time, and browse that email or just delete it as it comes in, without ever pulling out my phone. On a rainy/snowy day, or while biking (for some examples), don’t you wish you didn’t have to pull out your phone? If you plan on buying a wearable device, this is the one to get. I would give this a 9 out of 10, with room for improvement. And if you have any questions about the watch, just ask away (on here, Twitter, wherever, I’m not too picky…and I’ll answer it if I can)! Awesome review!! Cant wait to get mine!